People often ask me if I cook everyday. The answer is yes! I enjoy creating new things as well as cooking for my family and friends. My kitchen is always a busy place and truly is the heart of the home. Last week however, I cooked for a very special event which I had been planning for several months. It was for a fundraiser for The World Central Kitchen culinary school in Haïti. The World Central Kitchen Ecole des Chefs is a program established by internationally renown Spanish Chef Jose Andres. Following the 2010 earthquake in Haïti, Chef Andres came down to Haïti to assist and saw that he could help by creating a school. Through this program, Haitians could be trained in the culinary arts by providing them the skills and knowledge needed to succeed in a career in the hospitality industry. Not only would learning a skill provide a brighter future for each student but it would potentially benefit their families in the future as well. After visiting the school early this year, I had voiced an interest in doing something to benefit the students and school. I proposed this to my good friend Don Tanakorn, an amazing human being and a most gloriously talented chef and he was excited and thrilled at the idea. He immediately jumped on board and we began to plan our concept. We worked along with the school director Chef MiSol Chevallier and the WCK US based Program director Chef Daniel Traster to finalize the details for a truly a very special evening and all for a most worthy cause. The event was done with the full intention to raise money to fund scholarships for the students, particularly those in need. The amazing team who worked to make the dinner a reality. I have always been a proponent for the value of a good education in life. My husband and I work with several foundations which promote and foster education in Haïti. For us, a strong education base is imperative in creating and transforming positive change and growth in Haïti. Having a structure with good role models and teachers allows a society to grow and develop to its fullest potential. A country’s worth is truly in its people and what better way to invest ones energy than in programs which foster the growth of the mind and spirit. The event Don and I decided upon was an Asian themed dinner. The menu was built around the foods which we know from our cultural roots. Don is a Thai native and I am Guyanese but with strong Asian roots. We put our collective energies together to build a menu which was delicious, exotic and representative of our countries. This was a major draw for our potential guests as these flavors are not easily accessible in Haïti. We spent 3 days prepping and cooking for our event along with a team of aspiring young chefs in training from the WCK culinary school in Port au Prince, Haiti. We welcomed 50 guests along with our sponsors to join us in an all-inclusive dining experience dubbed a culinary journey of South Asia. The menu card for the evening. 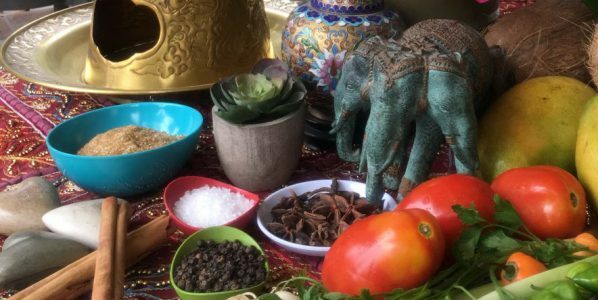 The menu was carefully selected for the evening to showcase the tantalizing flavors of Thailand and India, with a Guyanese twist. We hosted the event at the school which is an awesome location and quite a hidden gem in Port au Prince. Perched on the side of a hill over looking the city, the open concept reception area was the perfect place to host the dinner. Not only were guests able to have a glorious view of the city while they dined, but they were in the open kitchen concept of the school’s state of the art classroom. The tables were beautifully set and fragrant blooms of tropical flowers adorned the tables, giving color and setting the tone of the evening. The sounds of contemporary jazz filled the air and the stage was set to welcome the guests for the gastronomic evening. On arrival, guests were welcomed with delicious cocktails devised by Chef MiSol and her team. There was a special fruit punch made from fresh local fruit such as oranges, limes and cherries enhanced with a generous kick of Haïtian rum. A delightful mini popsicle made of frozen soursop juice was a novel addition to the glass. In addition, there was a glorious fresh beet and orange libation embellished with a slice of roasted caramel beet. Guests sipped on their cocktails while sampling steaming hot Thai beef spring rolls and Chinese style Shrimp and cilantro fried wontons with a dipping sauce of homemade pepper jelly. This was the introduction to the evening before being seated at tables for the served courses. French white and red wines were also specially chosen for the meal as well as a sparkling Chardonnay. First on the menu was a duo of delights served by the student waiters to enthusiastic guests. The rectangular platter was composed of a puff pastry filled with a flavorful chicken curry with notes of cumin, ginger and garam masala and a dipping sauce made of spicy tamarind. Alongside, were also a pair of satay beef tenderloin skewers, cucumber salad and an awesome peanut dipping sauce. Beef Satay with peanut sauce and a chicken curry puff with tamarind sauce. The second course was a fresh green papaya salad with lemongrass shrimp skewers; a Thai delight. Many of our guests had never tasted this wonderful traditional salad and were quite intrigued by the flavors and harmony of the pungent fish sauce, palm sugar and lemon grass dressing. Most people associate papaya with the ripened form of the fruit. They were quite surprised by the use of it in its green firm state, forming a savory salad. The soup course was a delicious chicken galangal soup. The broth was made with chicken, galangal and other Asian aromatics as well as coconut milk and lime juice. Galangal is an important ingredient in Thai cooking and is a little known ingredient in this part of the world. It is a fragrant rhizome resembling a ginger root but with a slightly citrusy flavor. It was served in ramekins with a squeeze of lime and cilantro leaves. It was now time to serve our entrees. I had crafted a plate of Indian flavors for the evening. My offerings were a spicy Madras style beef curry and a lighter flavored vegetable curry of potatoes, carrots, garden peas and garbanzo beans. There was also a creamy spinach cooked in coconut milk and a refreshing yoghurt and cucumber raita. A sweet tomato raisin chutney was an additional condiment which offered a lovely balance to the spicy curries. I also made lots of paratha roti, an Indian flat bread which is the perfect accompaniment for the curry. The dessert course was the finale to the Asian dinner. There were two choices served representing the tropical and exotic theme of the evening. A warm coconut sticky rice with slices of sweet Haitian mango was a homage to the Thai menu. The second was a tropical trifle coupe. I layered thin slices of vanilla cake with 3 fruit coulis layers for flavor and dramatic color. There was a luscious layer of Francique mango coulis, a bright and slightly tart passion fruit curd and a brilliant chunky strawberry coulis. A layer of vanilla pastry cream was added to compliment the fruit flavors. Finally, it was all topped off with Chantilly cream, strawberry, kiwi and a sprinkle of toasted coconut. The trifle was a cool refreshing taste of the islands in each spoonful. Dessert course of sticky coconut rice with mango and tropical fruit trifle. Sparkling Chardonnay with lichee. As our dinner came to a close, there was a huge sense of contentment and happiness that the evening had been well received and appreciated by those in attendance. For me it was the realization of a dream to give back in a positive way to my community. I am absolutely thrilled that our collective efforts were able to materialize something good. I am awed about the teamwork and am thankful to the selfless contributions of others like our friend Stephanie who marketed the event and set up a website for the invitations and ticket sales. The wines to compliment the different courses were also kindly donated as were some of the food purchases from a local supermarket. The beautiful tableware was also a huge donation to the school from a company in the USA specializing in restaurant tableware and will be a valuable asset for the school for future events. The flower arrangements, tables, printed menus, music and sound were all kindly offered to us by wonderful people, all sharing their talents and knowledge to make the evening a success. Chef DanTraster of The World Central Kitchen thanks everyone for coming out to support the dinner. I was so proud of the students and their willingness to work hard to show case their newly acquired knowledge. They did whatever we asked to collectively make the evening a success. Practice makes perfect, and the evening was a test run for these young people. It was a great way for them to see how much it takes to prepare, how to react under pressure and how important it is to work collectively as a team to make things a success. Even when things go awry, it’s also very important to regroup quickly and pull together, keeping things on track and in perspective. Going over some last minute sets with students before service. It’s such a beautiful thing when we see how charitable and kind people can be in helping to realize a goal. It’s heartwarming that many people came together to support an effort for the benefit of the school and students. It all made for a magical and unforgettable evening and one which I will not soon forget. The executive staff of WCK and our friends from Front of the House who made a great donation of tableware to the school for the event. Me, taking a moment to appreciate all of the work before the dinner service. I am so proud of my daughter Gabby, a young epicurean and budding Chef for working alongside all of us. It was a great lesson of hard work and perseverance. Thank you And I love you. I appreciate your kind words. It was wonderful to do something for the benefit of the culinary school and to help some very deserving individuals.